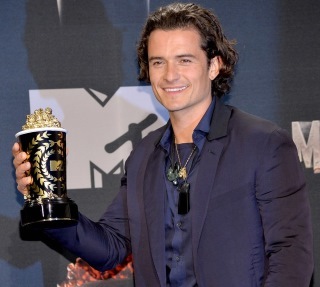 After Jodie Foster and Jake Gyllenhaal, here is an article about the impassioned Orlando Bloom. What a good example of a Neptunian! As soon as Orlando Bloom's horoscope is cast, what is eye-catching is wonderful Neptune conjunct the Midheaven, the career angle. In addition, the planet is in exact trine with Saturn in Leo in the 6th House, radiating the vital energy of Fire at the service of a durable social ascent. Although the aspect is considered generational, it exerts a major influence on the comedian because its strength comes from the time of birth. Moreover, Neptune brings a touch of gentleness, of romanticism, and of artistic inspiration into a chart which, otherwise, could be deemed cold. Indeed, winter traits prevail, since Capricorn, the Sun sign, shelters a Mercury-Mars conjunction, two fast planets, which is also quite noticeable. At the same time, Aquarius on the Ascendant endows him with a humanistic facet which is not too warm. As one looks at Bloom's path, one finds the illustration of these tendencies. Born in Canterbury, Kent, Orlando Bloom receives a typically British education, probably austere and defined by rigid rules. He happens to be dyslexic, which limited his success in the beginning. The astrologer believes that the Mercury-Mars conjunction in Capricorn should be analysed. On the one hand, Mercury, symbol of the word, is retrograde, a not so rare phenomenon which in some cases means either speech or gesture impairment, or learning difficulties at school. On the other hand, Pluto in Libra thwarts this conjunction. Therefore, Mercury is muffled whereas he is willing to forge ahead with Mars. Fortunately for Orlando Bloom and for the film industry, his mother prompts him to take acting classes in order to overcome his problem. He enjoys them, and this time, these experiences give him wings rapidly. At the age of 16, he goes to London and tries out various artistic activities, especially photography, Neptune's domain par excellence, since this planet is often associated with images and music. Bloom also practices sculpture, a less Neptunian discipline. In a quite natural manner, he finds his way to the cinema, which better matches his Water dominant. As it is well known, the character of Legolas in the saga The Lord of the Rings enables him to launch his career and to raise to fame. The brave and romantic hero with his long and fair hair suits Neptune in Sagittarius who is born to save the world. It is also reported that the director chose New Zealand and its most remote and out of reach territories to evoke the work of Tolkien. This pertains to the signs of Capricorn and Aquarius, meant to conjure up inhospitable places and harsh climates where life must be understood in terms of survival. Immediately afterwards, in Pirates of the Caribbean, Bloom gets a new similar role as a bashful lover. However, he does not follow this saga, at least as of now. He also plays other hero parts, like in Troy, or more romantic ones. At 37, Orlando Bloom is unwilling to be restricted to one style of character, which could happen with his chart which is introverted than extraverted. The ruler of his Ascendant in Scorpio gives the actor an extra touch of passion, even though here also, it is difficult to come up at the surface. However, since the chart is powerful and marked by a "good" Saturn, the master of time, it is doubtless that Bloom's career will evolve in the long-term. Let's get back to the Scorpio hue, which is read not only in relation with an interesting Uranus forming numerous aspects and ascertaining an original behaviour, but also with the Moon. She is in the early degrees of the sign and applies a conjunction to Uranus, which underlines the will to express in an intense way the whole gamut of human emotions. Besides, let's add that in the area of love, Bloom is quite unstable. He is affected by Water because, in addition to the Moon, his Venus is in Pisces, a Water sign too. Venus trines Uranus and turns Blooms into a lady-killer attracted by beautiful actresses with whom he may confuse fictitious flights of romanticism with reality. Hence the fact that he resumed celibacy. You can also read the Astrotheme astrological portrait of Orlando Bloom. But in 2015, he is affected by transiting Neptune, the importance of whom we already mentioned, on his natal Venus. It's odds-on that his love life will be anything but dull... However, the transit of Neptune is hindered by Saturn in Sagittarius. We therefore observe that an important aspect of the natal chart is activated, this time by a tensed aspect though. It is also possible that the actor undergoes a few delusions regarding the consequences of his Legolas role, since this time Tolkien's saga is definitely over. The seasoned astrologer would advise him not to let disappointment overwhelm him, because simultaneously, Jupiter transiting the Descendant, heralds popularity and successful financial and/or love partnerships. Furthermore, during the second half of 2015 and at beginning of 2016, Jupiter enters Virgo and support Bloom's planets in Capricorn and in Scorpio. As to progressions, the actor has been going through an eventful period since 2012, since his progressed Ascendant in Taurus has started to impact the natal planets in fixed signs. This may point to existential blocks which will subside as from 2016.